Mary and Kingsley, are on the driveway. In 2010, Waverley borough council decided to allow the owner, Fossway Ltd, to divide up the property. Campaigners trying to save the house as a single entity launched a judicial review, and have now won their case at the high court in London. Mr Justice Cranston said legal flaws meant that the council’s decisions to grant planning permission and listed building consent must be quashed. Hailing victory in “a long and difficult battle” to save Undershaw, [representing lawyer John] Gibson said: “This is a place which is steeped in history and should be treated with reverence. Conan Doyle’s life and works are a fundamental part of British culture and arguably their stock has never been higher. We have been absolutely delighted to see enthusiasts from across the world get in touch and pledge their support to our efforts. 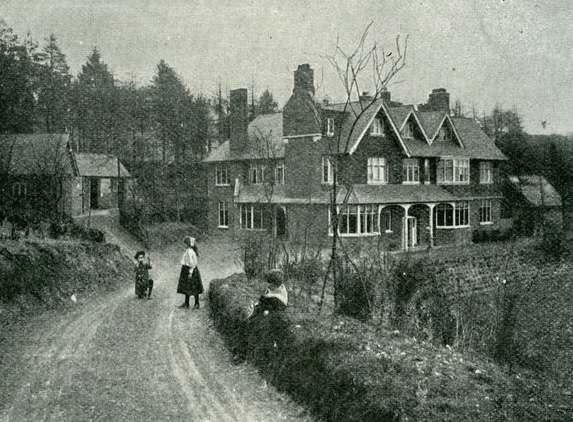 Conan Doyle chose the location for Undershaw in accordance with the needs of his wife, Louise, who suffered from consumption. Before Louise’s death in 1906, when he remarried and moved to Crowborough, the author entertained friends including Peter Pan author JM Barrie and Dracula creator Bram Stoker. In a 1907 article, Stoker described Undershaw as having “all the elements of home” and said the view from the drawing room was one of “a never-ending sea of greenery” to the South Downs. Conan Doyle did not sell Undershaw until 1921 and, in 1977, it was listed as being of special architectural and historic interest because of its literary association.